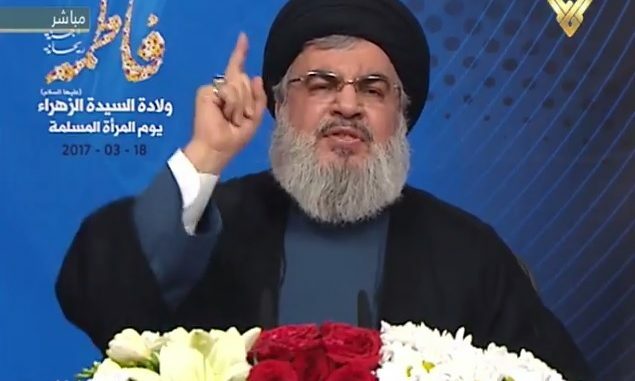 In a recent speech, Hezbollah’s leader Sayyed Hassan Nasrallah said that the coming final victory of the ‘Resistance axis’ over ISIS (Daesh) led Israeli Prime Minister Benjamin Netanyahu to ‘crawl’ to Moscow to ‘beg’ President Putin to prevent the militant organisation’s total collapse in Syria and Iraq. The ‘Resistance axis’ can be broadly defined as composing Iran, Syria, Hezbollah, and increasingly Iraq and Yemen, in addition to Palestinian groups such as Islamic Jihad and Hamas (to fluctuating degrees). Let us remember abit, at the outset of the seventh year (of the Syrian crisis), (let’s) remember the first year. We do not deny that a portion of the people really sought after reforms and a change to some of the realities in Syria. However, what strongly entered (the scene) and changed this whole track, was the Takfiri powers who were brought from all over the world, and they rejected any political dialogue from the very first weeks, and they rejected any political resolution, and they rejected any communication, and they took a decisive stance, and they went towards bloody, widespread, and all-out armed conflict, and they raised sectarian and confessional slogans, and it unveiled the truth regarding its objectives and its enmity towards the resistance, from the very first weeks. Okay, who brought the Al-Qaeda organisation? – when they brought it into Syria, what was its name? The Islamic State of Iraq. They later added to it ‘and the Levant’. Later those who are called ‘The Islamic State of Iraq and the Levant’ differed, they became two parts: Daesh, and the Nusra Front. Yet in reality, all of them are what? The Al-Qaeda organisation, which is placed by the Americans on (their) terror list, and by the (UN) Security Council on (its) terror list, and by the Saudis on (their) terror list, and by the Europeans on (their) terror list. They themselves brought along tens of thousands of fighters which they themselves have placed on terror lists, they provided them with funds, weapons, and opened up the borders for them, and they brought them to Syria. And they themselves admit that they made these (militants), and that they made Daesh, in order to fight the resistance and the resistance axis. Today, the scene has changed. I don’t want to take long on this point, I just want to touch on the developments, I want to remind first of all, that in the first year – and the issue did not require much political understanding, nor for one to make predictions, anyone who has read the contemporary experience in Afghanistan and other places could have been able to reach the following conclusion, the one which I told them in the first few months (of the Syrian crisis), I addressed the Al-Qaeda organisation – by name, and the Islamic State of Iraq and the Levant – Daesh – and the Nusra Front, which separated from it, and I told them: ‘You – from all citizenships – were brought to Syria in order to be gathered up there. You were brought to Syria…’. Now anyone can go back six years…’You were brought to Syria in order to be gathered up there, and in order to be used in the fighting, in order to achieve the American-Israeli objective in the region. And after you are used up – whether you win or lose – you will then be finished off. You were gathered up so that you can be finished off, after having been used’. And for this reason, I called on them from the beginning to be careful, and to wake up, and not to become firewood – into firewood and fuel – in the fire of America and Israel, and some regional states, who plot against them and so they will pay the price. However, fanaticism, foolishness, ignorance, and stupidity, did not give them any chance. They considered themselves to be very intelligent, thinking that they are using America, Turkey, Saudi Arabia, world states, and western states, with the aim of gaining the opportunity to establish their own project in Syria. And they wrote this in (documents relating to) their strategic projects. And this was the pinnacle of foolishness. Today what is happening? After Daesh turned into a burden for the American project here – Daesh is nearing its end in Iraq. (In) a few weeks, months, it’ll be finished. Daesh no longer has any military or political future in Iraq. In Syria also, Daesh will never have any political military future in Syria. Best case scenario is that they will continue to have sleeper cells (through which) they carry out suicide operations to let off some steam, because the suicide operations that target civilians in Baghdad, Tikrit, Damascus, Homs, or other (cities), is an expression of strategic failure, and military failure. When one prepares suicide bombers to kill children, women, and people walking in the streets, and school students, then he is a strategic and military failure. Such a person is extracting revenge, he is not fighting. This is the future of Daesh. The future of the Nusra (Front) is the same thing. Today Daesh is being targeted by the international coalition led by the United States of America, and (targeted) by Britain, Turkey, and Jordan, and is also being targeted by Russia and the power(s) that are confronting it in Syria. And the Nusra Front as well, the Nusra Front which were brought along by the Americans – and their allies in Turkey and the Gulf states, the Nusra Front is now being targeted in Idlib and western Aleppo. Isn’t this what we told you six years ago? Now voices have begun to emerge in Idlib and western Aleppo that ‘this is America, this is the trickery and hypocrisy of America….’. (Well) good morning! After you have destroyed Syria, after you destroyed Iraq, and after you are destroying Yemen?! Now you wake up (regarding the reality of) America – that it is deceptive and hypocritical, which uses you then slaughters you? This is the truth. And with this – ofcourse Israel intervenes every day, and using various pretexts. The pretext of targeting missiles (heading) to Hezbollah as was claimed yesterday, using any pretext. The pretext that a mortar shell landed in the occupied Golan Heights e.t.c., it intervenes and targets bases of the Syrian Arab Army, in order to provide support to Daesh, or to these terrorist factions. Today, this arrogant, occupying project – the project of (gaining) hegemony and control over Syria – I tell you in full honesty: it has failed. And Syria has gained victory, yet it continues to wait for the big, decisive (final) victory. The remaining factions…Daesh is on course towards annihilation, and the Nusra Front is on course towards annihilation, and the (other) terrorist, Takfiri factions are on course towards annihilation. It is only a question of time. Even the world that funded, armed, helped, and aided them, has now forsaken them, and is now fighting them, because the magic has turned on the magician. Because the world has realised that this serpent which it brought along, now poses danger to it and is poisonous – in Paris, London, Germany, Belgium, and within Turkey, and within America, and within Saudi Arabia e.t.c. The remaining Syrian opposition factions – okay, what state are they in today? They neither have a leader, leadership, united (front), national project, nor do they know what they want, they are dispersed and lost between embassies and intelligence agencies. Yes, one still bets on national figures within the opposition, or national frameworks within the opposition, …in order to rebuild Syria once again. Do not believe that you are on the side of Islam, the Ummah, and the nation. Whether you know it or not, you fought for six years on the side of America and Israel, and on the side of those who are plotting against you, (in order) to kill, imprison, and slaughter you. Does this bloodshed in Syria and Iraq not wake you up? Does all this not suffice for you to revise your outlook? I call on them to throw away their weapons, to truly stop the fighting, for a ceasefire, to search for a real humanitarian and political resolution, to move from the side of hypocrisy to the side of Islam, and from the side of Israel and America to the side of the Ummah, and from the side of the enemy to the side of the resistance. And this is still possible. This is still possible. To stop this destruction – there are no horizons for your project. The resistance axis – as we said in the very first days and months (of the crisis) – today after six years, from the beginning we said the resistance axis will never be defeated in Syria, nor in Iraq, nor in Yemen, and it will never be broken, and these six years have now passed, and the resistance axis is achieving victory in Syria, and is achieving victory in Iraq, and is remaining steadfast in Yemen, and it will achieve God willing, the decisive and huge victory.